A group of critically endangered red-headed and white-rumped vultures at a vulture restaurant in Mondulkiri Protected Forest, northeastern Cambodia. 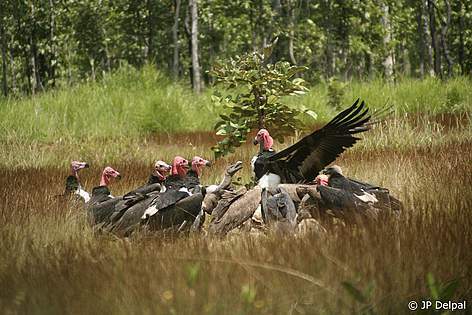 Globally significant populations of three species of critically endangered vultures still persist in northern and north-eastern Cambodia, red-headed vulture (Sarcogyps calvus), white-rumped vulture (Gyps bengalensis), and slender-billed vulture (Gyps tenuirostris). These species have undergone dramatic declines of 95-99% on the Indian subcontinent due to the poisoning by the livestock-drug Diclofenac ingested from animal carcasses. Though this drug appears not in use in Southeast Asia, populations have decreased there as well, most probably because of a decrease in food availability due to shrinking wild ungulate populations. The remaining populations are very small, numbering a few hundred individuals at most. Nesting populations in Cambodia are supported by regular supplemental feedings of domestic cattle carcasses through a joint monitoring effort of WWF, WCS and BirdLife International. Because of the absence of Diclofenac, Southeast Asian vulture populations are of critical importance to the global survival of these three species.